The Great Bend of the Gila National Monument proposal in Arizona’s Sonoran Desert is 84,000 acres of what the National Trust for Historic Preservation believes is one of the Bureau of Land Management’s most important cultural sites in the Southwest. 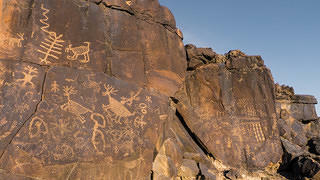 The Bureau of Land Management has recognized the importance of the area’s cultural and historical resources in an administrative designation, but these highly significant resources need a higher level of protection, management, and funding. 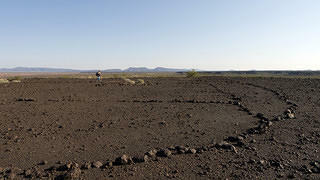 Geoglyph on the Sentinel Arlington Volcanic Field. The Great Bend of the Gila has been an important crossroads where the history of many people, cultures, and ways of life have been written on the land. Archaeological remains of ancestral Hohokam and Patayan cultures run along what was the life-giving Gila River in Hohokam villages and ball courts. 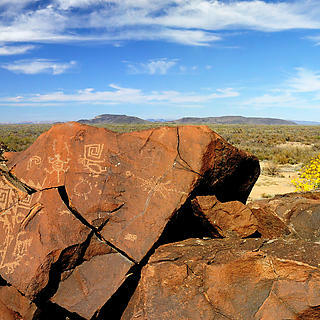 The oldest traces of human presence in the Gila date back to 3,000 BC. Summit trails and geoglyphs (large patterns of stone laid out on the earth in geometric or human and animal shapes) mark important ceremonial sites for these ancient cultures. 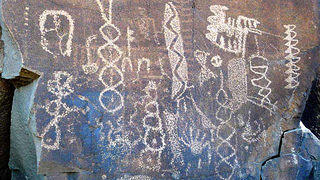 Rock art panels run throughout the corridor of the Gila River valley, culminating in the rock art of Sears Point in the western portion of the proposal. Archaeologists working in the area consider Sears Point one of the most significant rock art sites in the Southwest. 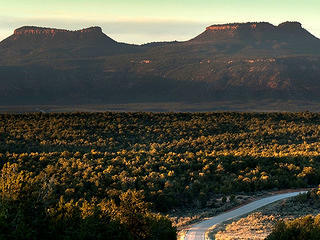 Many Arizona tribes hold these lands sacred. The historical resources in the proposal are significant as well. No fewer than three historic trails run through the proposal area: the Juan Bautista de Anza, the Butterfield Stagecoach, and the Mormon Battalion. The National Park Service has already recognized the significance of the Juan Bautista de Anza and designated it a National Historic Trail (or NHT), and is currently conducting a special resources study for designation of the Butterfield Stagecoach Trail as a NHT. The Mormon Battalion Trail is highly significant to the Mormon community, among others, marking the brave struggles of those who traveled west on a military expedition and created a trail into the frontier that would be used for years to come. The western boundary of the national monument would protect the site of the western-most skirmish of the Civil War. And throughout the proposal are remnants of historic homesteading, mining, and ranching. Designating the Great Bend of the Gila as a national monument and increasing the public's awareness of the need for better funding and management of cultural resources on our public lands will permanently protect this nationally significant landscape, that helps tell the full American story. Cultural Resources Study: "Great Bend of the Gila: A Nationally Significant Landscape"
Ethnographic Study: "Great Bend of the Gila: Contemporary Native American Connections to an Ancestral Landscape"
To protect the unique and irreplaceable cultural and historic resources of the Great Bend of the Gila area. 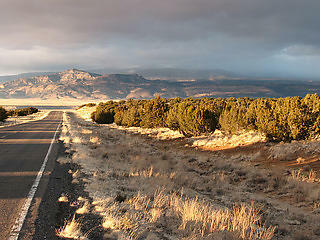 Donate to our campaign to save the Great Bend of the Gila.